I'm good enough, and I'm smart enough, and gosh darn it, people like me, even though I don't understand the appeal of <i>Hera Pheri</i>. I'm good enough, and I'm smart enough, and gosh darn it, people like me, even though I don't understand the appeal of Hera Pheri. Clearly, overall, I just don't get it. And that's okay, because I'm not from Maharashtra and I don't speak Hindi and sometimes I respond poorly to wackadoo movies in the languages I do understand. But that's no fun to read, so here are a few things I did get (or at least I think I did), for better or worse. I like when people are willing to be goofy, and this movie had that in spades. Having only seen Tabu in serious roles, and Sunil in fake-pretend serious roles, I was happy to see them being silly here. 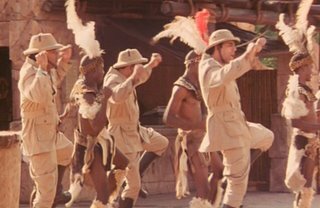 There's a song teleport to South Africa, and it's rich with...um...well, theme-park exoticization of "other," I guess you'd have to call it. I know that turning people who are different from oneself into caricatures is universal, but I'm strangely comforted to see the evidence that westerners aren't the only people who do it. So get your Gunga Din on and boogie down! You know I love this shirt, especially when you get to see all three of them in it. 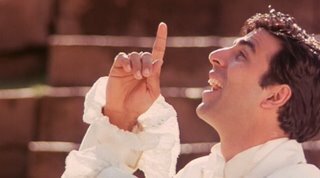 Even though it's just Akshay, I liked this picture because the oodles of white fabric give him a sort of angelic look, and the happy face and heavenward gesture complete it. It's like he's saying, "I know, isn't it fab?!? The big guy upstairs has a simply divine knack for costuming!" This is just funny. 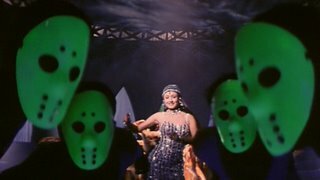 For those of you who haven't seen it, this is part of the same song as above ("Tun Tunak Tun"), and though the movie offers no explanation of how - or why - glow-in-the-dark hockey goalie masks fit with Indian fake-pretend African dancing, boy am I glad to live in a world in which they somehow do. No. Just no. Stop portraying women being turned on by animals. It's gross. It was gross when Budweiser did it with Spuds McKenzie, and it's gross when a writhing woman has a writhing snake between her legs. It's also just lazy - I mean, gee, I wonder what a snake might represent? This is also the kind of thing that makes me concerned for the fate of male-female relationships (or at least mine): is this imagery attractive? alluring? or even interesting? Do men want to see their female significant others fondling (or, even more ew, being fondled by) snakes? Because if so, I'm done with the whole enterprise. Maybe I'm just feeling worn down by the club scenes in my song DVD (see yesterday's post), but normal women aren't going to live up (down) to this (should categorically refuse to try). Like me for who I am, not for...this. Okay, now I'm going to go watch Muriel's Wedding. It always restores my faith. Maybe I'll cast the Bollywood remake while I'm at it. Hockey goalie :D - I have to stop laughing since I'm at work. Looks like this movie has its Indiana Jones moments. The snake picture is gross! Eww..
> Gee, I wonder what a snake might represent? And yes, I'd be SO creeped out if this woman+snake set up actually had takers. Oh wait, since they're *showing* it, it must have some takers, right? I wish I hadn't just thought that last thought. Eeuw. Was the 'snake scene' there in hera pheri...how did I miss it? 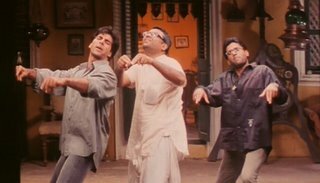 Btw, hera pheri is a total dialogue-oriented comedy, and not exactly slapstick, sso visually it is not as appealing as it is when you understand the dialogues. Also, there are many puns in there, so it will be difficult viewing. I had watched it at home when I was in US, and now in india, I always watch it when it comes on TV. 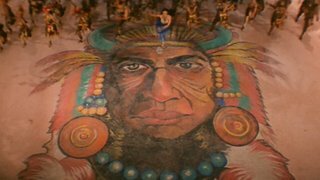 I watched the original in malayalam - Ranji Rao Speaking, which was one of the biggest hits this side of the world. It technically does not even come anywhere near Hera Pheri, but still remains one of the most-loved films in Kerala. Firstly and most importantly, I heart Toni Collette. She is the awesomestest. And you totally need to write a proper post on the whole women in media issue, I'd be really interested to read that. The third picture is fab, the one with Akshay in a frilly shirt. Very The Princess Bride! Reading the other comments, it seems Hera Pheri just doesn't work for us non-Hindi speakers, which is a shame because I think I might like it if I could understand it. I prefer dialogue-oriented to slapstick comedy (almost) any day. You mean you wouldn't writhe around on the floor with a snake?? My image of you is completely shattered. I'm leaving you forever. ggop - I implore you to email me so we can make each other laugh more often. Aswin - excellent question. I looked online for pictures of this place and it's almost as horrifying without the dance numbers on top of it as it is with them! Next time you see HP, do watch the songs. They're awful. By which I mean "really funny." CS - am so glad that someone as smart as you will validate my concerns here. And yes, super ew. I think there's probably a taker for almost anything, but the fact that this kind of image shows up a lot maybe indicates...no no no, ew. EW. I mean, somebody obviously likes shiny writhing women in large numbers. If I can find out who, I'll ask them what's going on. Aparna - definitely. I'm always grateful when people tell me this kind of thing. Without all of you I would miss even more about the movies than I already do. And yes, the snake is there. Twice like this, and a few other times being held up by a scary muscleman guy. Poor snake. Poor item girl. Ew. Velu - maybe I'll try it! But if it's as dialogue-driven, then I'll be just as lost, if not more so, since I do catch the odd snippet of Hindi by now. And I think I caught Paresh Rawal doing some spoonerisms, but maybe my hearing is off. Maja - yes, she is the best. And I'll work on that post. Maybe it's one for Bollywoodbloggers, with everyone pitching in? I'm no expert, but lately I feel like I'm getting smacked in the face with a lot more that I'm finding objectionable lately. 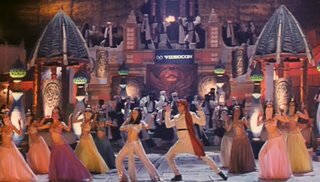 Shouldn't Bollywood do a Princess Bride remake? How fun! DC - Hee hee! Not even for Akshaye. Well, maybe for Akshaye. No. Must stick to my principles. lol i am so not attracted to watch hera pheri. tell me. do i need to? its a modern classic, naa? and everybody seems to have seen it. but some of your screencaps really scare me. well i think i´ll just put it on the far end of the "need to be watched" list for now. repression. works perfect for me. Also ROFL! Dear God. Hockey masks & African dance. May I be spared!